Are you experiencing the symptoms? Or, do you have the full-blown disorder? 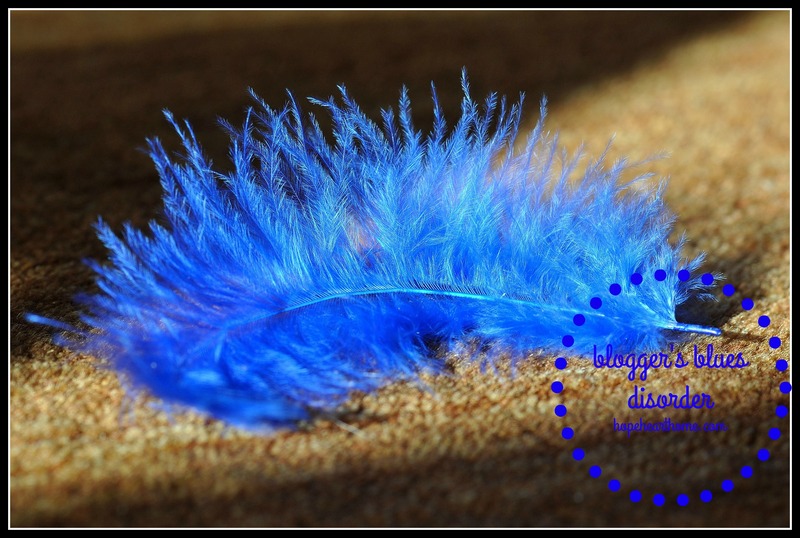 Has your #write31days feather turned a sad shade of blue? Take heart you are not alone! October is a writer’s high! #write31days is a blogger’s drug of choice! It’s a 31-day fix. Write when your well is full. Write when your well is half full. Push through when it’s dry. But, write you must. And, read, you must. And, comment, you must. If you’re part of a write-31 community, you share a post, you read five, and you comment on five. You read the comments on your post. You reply to the comments on your post. If you get a comment from someone you haven’t read, you click on their link and read another blog and leave another comment. It is crazy fun and adrenaline-pumping. Your daily stats go up (IF you have Google Analytics, which I don’t – WHAT?). Once in a while, a post might go viral and you are convinced this is it – you’re the next overnight blogging success – your Ann Voskamp moment has come! But the next day, not so much. Three days later the chart peaks again for daily hits. It is a 31-day wild merry-go-round ride. Anyone? My friend Tara definitely relates and calls it “withdrawal” – read about THAT right HERE! I think it’s called withdrawal…. been there, oh wait, maybe I am there. Missing all my #write31days sisters! Maybe we need an intervention, or a retreat, or something. Maybe it’s time to go write a blog post…but wait, I think I’ve used up all my best ideas…. *SIGH* maybe it’s just time for another cup of coffee or piece of chocolate. The blogger vices. I just had a KitKat, Michelle! I thought I would be like that and have certainly had moments of it. I have actually found it has propelled me into consistent writing for the first time. I am so looking forward to blogging about Advent so have several posts that I’m planning. I pray you get your inspiration again but also are encouraged that rest is a beautiful and needed thing. Jodi, I’m still inspired – just lagging a bit!!! I know you are right, Beth, and I’m not in a funk – I thought it was fun to write the words!!! Love this post. I’m indeed tired and missing my friends. I think I’m going through Write 31 days withdrawal. YES, that is exactly what it is, Tara. Write about it, please!!! Yes! I can totally relate, Susan! I’ve been struggling with these exact feelings since returning from Allume, actually, so before Write31Days even ended. It’s making me spend more time reflecting on WHY I do what I do, and reevaluating how I do it, too. But I think that’s a good thing once in a while, don’t you? So very true! Thank you for penning what so many of us are feeling now that our 31 days are done. Great post! Thanks so much for coming over today, Liana. I am the odd one out this year, I am so glad its over! I was just overwhelmed with life, and the challenge was too much on my plate. Glad we still have a place to connect and share tho! HE does!!! And, we are all connected. Amen? Wish we could share a cuppa. Yes! I got sick this week just like I used to after finals in college and have definitely struggled after coming down from the high. Thanks for articulating what so many of us feel! (And I loved the Ann Voscamp reference!). LOL! Wasn’t sure about that AV reference but I think we all think about those things! YES, WE CAN! Thanks for coming over, Lux. Oh, thank you! Last week, I think I wrote something or somethings. I can’t even remember. But I do know that I never bothered to linkup anywhere. It was too overwhelming to even read the host’s post, much less anyone else’s. Much less put in the time to simply linkup. I did experience that very thing! This week, I’m back, but have decided to simplify and post once a week so I can concentrate on my other writing. You know…the 500 book ideas swarming in your head, the 3 projects that have been sitting on the desktop crying for attention and being ignored. I’m so glad to read not only this post, but the comments—I thought I was the only one! I admit, I had other commitments that prevented me from doing the 31 day write this year. I can imagine the exhaustion afterwards though! 🙂 Thanks for the warning of what it feels like after you’re done. 🙂 This way, if I’m able to do it next year, I’m prepared. I admire everyone who did it! It’s a lot of work! Mimi, I am exactly to that point right now. I don’t know if I’m writing what my readers need to hear. I’m hearing crickets on fb. I’m talking about the real readers – not the blogger readers. Real people who really need a word of hope and encouragement – where are they? Yes, bloggers need to read too – but are we our own audience? Is anyone else out there??? And I’m not finding enough time to support my fellow bloggers. WHERE DOES THE MADNESS END???? I need some prayers today, my SFAM! Stopping right now and PRAYING. I love you Gigi. YSFAM I love what you said, “Are we our own audience?” I think that often. You had me smiling the whole way through this post! I am newer to the blogging scene and didn’t jump into the 31 days in October, but I do know and sense what that feels like. It’s a real downer to write a piece you have sensed the Lord speaking to you about and wrestle to put it in writing only to discover that it is the post that week that barely gets noticed or read. I scratch my head and the Lord reminds me once again that the numbers are not the key. The key is the single person He may have designed to read what I labored over for reasons I will never know because they may not even comment! And, Pam, THAT HAS TO BE ENOUGH! Thank you so much for visiting. I just had to comment on your post for two reasons. I’m a new blogger with writer’s block, and my name is Pam. Must be a divine linking opportunity:) I can relate putting yourself and the words that have flowed through you heart and hands in a post to send them off to cyber land. Love your thoughts on maybe, just maybe the one person who was supposed to see it did. Feel free to contact me at http://www.growingpam.com with your info for a new subscriber! TRUTH. I am replenishing by catching up on all the great reads I missed and by doing some journaling. I didn’t finish #write31days and I am exhausted. I cannot imagine how you and all the amazing women who DID finish must feel. Roaring to go, Shelby!!! Sort of! Susan, I am right with you and Tara! I miss October! We need to stick together and encourage one another! Susan – great post!!! I love the way you take on a subject and add just the right amount of humor and make an impact. I didn’t do #write31days – – truth be told, I was already overwhelmed and struggling with topics to write and not jotting them down when they would pass through my thoughts. I decided to take the month of October to finish other projects, reflect and contemplate what needs to happen as I move forward. The message for me from Allume seemed to be getting to the heart of why I do what I do and being ok with the season of life I am in. Blessings to you my new friend!! “why I do what I do and being ok with the season of life I am in.” Yes, THAT! Let’s encourage one another in the doing. You’re amazing! I did a lot of writing when I was younger and something in me still “wants” to write, but, also “fears” that at my age there’s no point in starting doing the blogging thing. I dunno. But, honey, you keep on keeping on because you are an inspiration AND a blessing to many.